I may not start with the concept of making a story a series, but as I write, I start to think of story lines with brothers, sisters, or best-friends who are introduced. What is their story? Is it worth telling? Sometimes my stories are stand-alone with the tread being a concept. With my Dog Tails series the characters in the various stories are not related, but have a common thread, they are all dog owners. 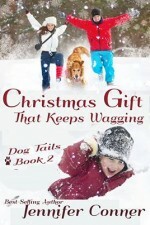 Book one, Central Bark at Christmas addresses abandoned pets and shelters, Book two, Christmas Gift that Keeps Wagging, covers trained seizure dogs and a single dad with a special needs little boy. Book three, Dog Tags, will be an Army man with a dog he is trying to get home that he rescues in Afghanistan. But in my Regimental Heroes series, they are all friends who suffer from PTSD in Victorian England. Best-friends, and then his brother and another friend with dyslexia. All brought together by the common thread of war and the era that does not understand what they are going through. Some stories work tied together, some don’t. What do you like to read? Stand-alone stories or if you enjoy it, do you want it to go on and on like I do? Best-selling authors Sharon Kleve and Jennifer Conner adore animals. That’s why they collaborated on this blog tour together. To showcase their Christmas stories celebrating our beloved pets. They hope you enjoy reading them as much as they did writing them. Brenda went to live with her aunt, who blamed their death on everything that represented Christmas; the gifts, the tree, and all the decorations. The festivities’ Brenda once cherished became something she dreaded under the shadow of her parents death. She lived in fear of something happening to the people she loved during Christmas. DEA agent, John Smith knows the significance of December fifteenth to Brenda, but when the head of the Nuevo Cartel escapes federal prison he’s forced to let her face the day without him, but not quite alone. Her boss, Corny Myers, tapped her pencil on Brenda’s reception desk to the beat of The Little Drummer Boy, which streamed from the Green Hornet Investigations Bose speakers. “Hey, Brenda. I have bad eating habits but I’ve never started the day with chips and salsa. What’s up?” Corny asked. Jennifer is an Associate Publisher for the indie e-book company Books to Go Now that resides in the Seattle area. Books to Go Now offers professional editing, cover design, multiple book format file creation, and most important–publicity. Their staff works to help make our author books a success one book at a time. She lives in a hundred year old house that she grew up in. Her semi- small town holds an interesting mix of resident hillbillies, yuppies and Navy Seals. And of course Seattle, only a few miles away, is the birthplace of Starbucks so coffee is always on the check list. She blows glass beads with a blow torch, (which relieves a lot of stress and people don’t bother you). 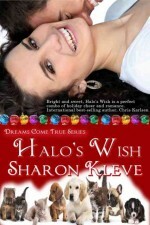 One (1) Winner will receive Sharon Kleve’s Book one and two of the Dreams Come True Series. 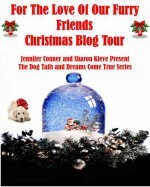 One (1) Winner will receive Jennifer Conner’s Book one and two of the Dog Tails Series.